SRINAGAR: At least eight people, including a civilian and an Indian army soldier, were killed in Indian-administered Kashmir on Sunday, capping off one of the deadliest weeks this year in a region already suffering its worst bloodshed in a decade. According to police, at least six alleged militants and a soldier were killed in a shootout in Shopian, a southern district of the Kashmir Valley. Also, a civilian was killed when Indian forces fired shots into a crowd of protesters that gathered near the scene of the shootout, senior police official Munir Ahmad Khan told AFP news agency. 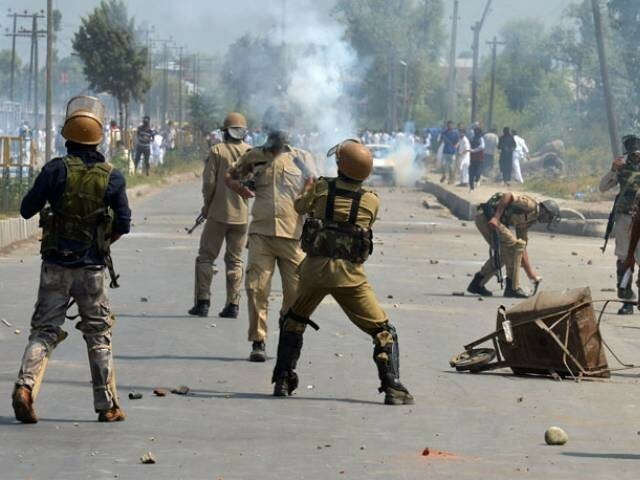 At day-break as news of the encounter spread, locals put up an intense protest, in which nearly two dozen civilians suffered injuries, leading to the death of at least one civilian. Noman Ashraf Bhat died, while Faizan Ahmad, whom a bullet grazed past, is in hospital. The police and paramilitary forces used tear smoke shells, pellets, and live ammunition to disperse the protesters. In the incident, at least four youths suffered bullet wounds and sixteen others hit by pellets and tear smoke shells. The fresh spate of violence came two days after Indian troops claimed to have killed “six separatist fighters” in an operation launched in Sekipora village, around 50km south of Srinagar, on Friday. Separately, Minister for Kashmir and Gilgit-Baltistan Affairs Ali Amin Gandapur lashed out at Indian forces for killings of Kashmiris on a daily basis and called on the country to stop the genocide. India will have to accept Kashmiris’ right to self-determination, he said. Meanwhile, the Joint Resistance Leadership (JRL) has called for a shutdown strike on Monday against the killing of seventeen Kashmiris by Indian forces over the past three days. According to Kashmir Media Service(KMS), the leadership, comprising Syed Ali Gilani, Mirwaiz Umar Farooq and Muhammad Yasin Malik, called for the strike following the killings of seven youth by the Indian forces during a cordon and search operation and firing on protesters in Shopian. The disputed region has witnessed a spike in violence since Narendra Modi, the Indian prime minister, took power in 2014. Analysts say the hardline policies adopted by the Hindu nationalist government may further worsen the situation. So far this year, over 500 people, including a large number of civilians, have been killed in occupied Kashmir and more than half of them were freedom fighters fighting against the Indian rule. The number of the dead is the highest in the state since 2008 when 505 people were killed. It is the deadliest year since 2008, said the Jammu Kashmir Coalition of Civil Societies, underscoring a worsening security situation in the Muslim-majority region controlled by India and half a million of its troops. A police official said the high number of casualties in 2018 was the result of “good actionable information “leading them to armed rebels and their hideouts. However, critics and local resistance leadership disagree. They say the Indian forces were escalating tensions in the restive region ahead of general elections next year in order to look tough on “Pakistan and militancy”. Indian security forces have used excessive force in Kashmir and killed and wounded numerous civilians since 2016, the United Nations said in June as it called for an international inquiry into alleged violations in the disputed territory. The UN report focuses mainly on serious violations committed in the northern Indian state of Jammu and Kashmir from July 2016 to April 2018. Activists estimate that up to 145 civilians were killed by security forces and up to 20 civilians killed by armed groups in the same period, it said. UN High Commissioner for Human Rights Zeid Ra’ad al-Hussein had also called for maximum restraint and denounced the lack of prosecutions of Indian forces in Jammu and Kashmir due to a 1990 law giving them what he called “virtual immunity”. Shortly after its publication, New Delhi rejected the report, blasting it as “fallacious” and termed it “Pakistan authored” and a “nefarious conspiracy” against India. However, the allegations were shot down by the UN and Pakistan. “The report was developed through remote monitoring,” the UN high commissioner had said in response to Indian allegations.